I'm not quite sure if BMW's design is a fortunate one. But it's very effectively conveying an aggressive mean emotion, just as effective as Maximillian was as the quintessential bad robot. This overall concept of vicious illumination is part of the current mainstream in automobile design. As this article already pointed out: makers are in a competition here, coming up with ever more aggressive body and even more light design. The escalation of "dynamic" seems to be "aggressive". While the premium segment had the bullish stance first, the trend began trickling into the lower end car ranges and is now ubiquitous. 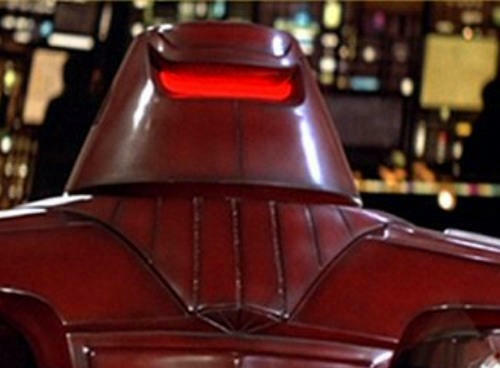 It will be interesting to see the design evolution of Maximillian in the upcoming remake of The Black Hole, especially with Joseph Kosinski being a keen observer of automotive design. Will automotive design influence the world of movies, or will the movie provide a conceptual template for car lights? ...given the trend is still going when the film comes out. If you're interested in roots and influences of The Black Hole's V.I.N.CENT, go here.